There can’t be many English villages where rural idyll and contemporary art have met with greater intensity than at Shoreham, and where an inspiring idea for a sculpture trail in the villages’ private gardens established a link that reaches back almost 200 years. This was the time when the painter Samuel Palmer and his ‘Ancients’ lived here, depicting the landscape in works that still today capture our imagination with their mystical escapism inspired by Blake and in some measure also by Milton. Walking the trail on the hot sunny Sunday it seemed to me that the artists involved took their brief for the treasure trail as a challenge to recapture the paradise lost with the age of Samuel Palmer and his friends, for whom Shoreham became an escape from the vicissitudes of their times. However there was one fundamental difference between the artists at Shoreham today and the ‘Ancients’, for while the latter took flight from reality most of the works on show engaged with the world today. Heather Burrell’s disquietingly beautiful ‘Iron Lungs’ referenced today’s most pressing environmental issue of air pollution, whilst Suzan Swale’s deceptive, retro look dress-painting ‘The Wasteland Diaries’ pointed directly to the pollution caused by plastic, a dramatic (fashion-art) statement in every sense. 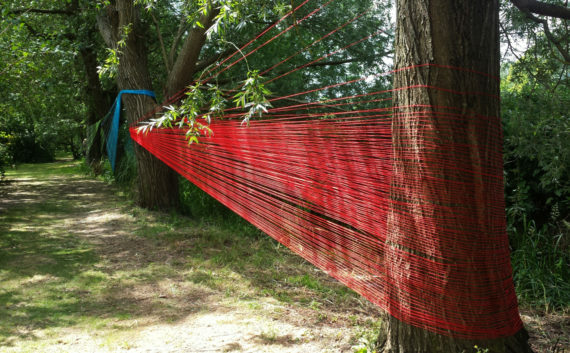 Martin Heron’s poetic ‘Environmental Entanglements’, of wool threads artfully wound around trees enchanted the viewer with their colorful intricacy so abundant in nature itself, whereas Angela Wright’s inconspicuous ‘Water Marks’, a line of sticks stuck into the riverbed and held upright solely by being thickly intertwined in the flowing river was a thought provoking work, touching on the fundamental question of interdependence. All of these works did not suggest an escape into a mythological alternative rather they documented the fragile beauty of the world we live in today. 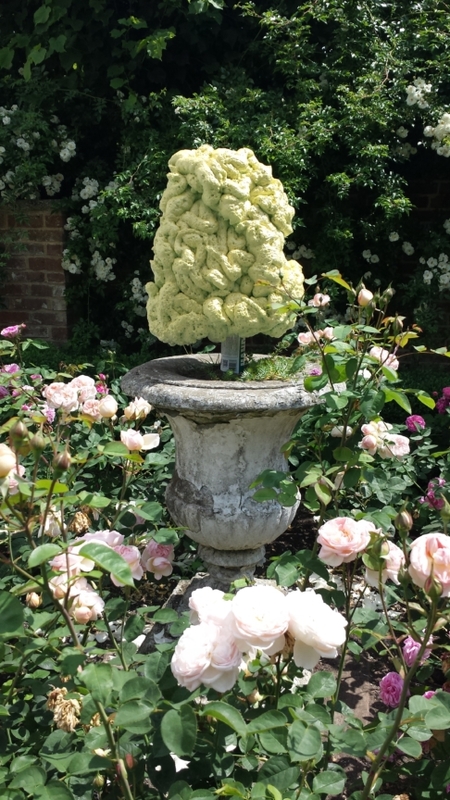 Though far from solely centering on today’s issues many artists celebrated Shoreham and its history with great imagination, such as ‘In a Shoreham Garden’, two serene sculptures by Clive Burton inspired by Samuel Palmer’s 1829 painting of the same title placed befittingly in the garden of Water House where Palmer stayed for a time. ‘The Shoreham Spittlebug’ a work by Genetic Moo found under a tree surprised and delighted in its gooey yet beautiful strangeness that referred to the fascinating life cycle of this insect, whilst Marigold Hodgkinson’s serene ‘Crescent moon phase’ appeared to have descended from the sky on to the water meadow recreating the visionary feel in many of Palmer’s paintings. Some artists such as John Crossley with his colorful ‘Tree Hugger’ responded with humor in their work, or surprised with their inventiveness such as Matthew Kolakowski and Jane Eyton with ‘Contact’, a long chain of ice cream cones garlanded around trees, a wonderfully playful art work yet audaciously fragile in the woodland setting. Phillipa Tunstill’s ‘Pole Dance’ consisting of brightly colored broomsticks placed on the lawn of Queen Ann House were another example of art as joyful manifestation. Returning to today’s issues Alice Cunningham’s stunning ‘Refuge’ of a huge silver colored blanket draped around a tree house pointed to the current refugee crisis, the shining magnificence of the material standing in stark contrast to the situation of the people that would shelter there. 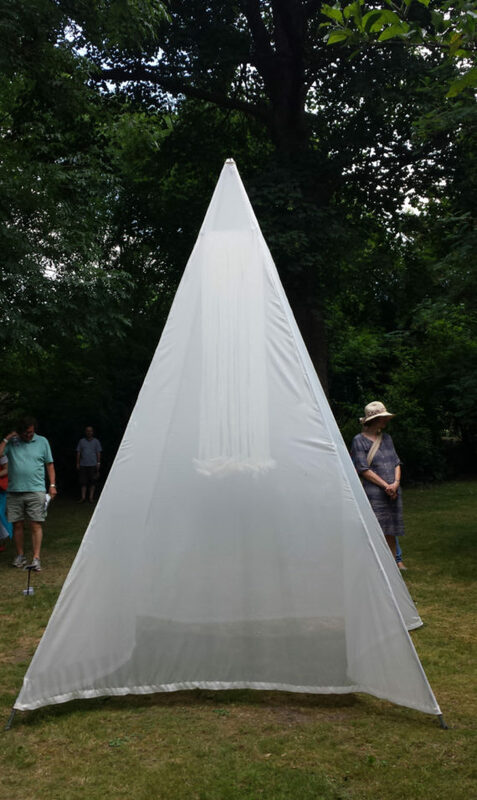 The theme of disadvantaged people was also explored by Marilyn Kyle’s poignant installation ‘Paper Mill’, a transparent paper-white pyramid referring to the people, including many women, who worked at the local paper mill at the turn of the 19/20 Century struggling with poverty and the fall-out from the 1. World War. 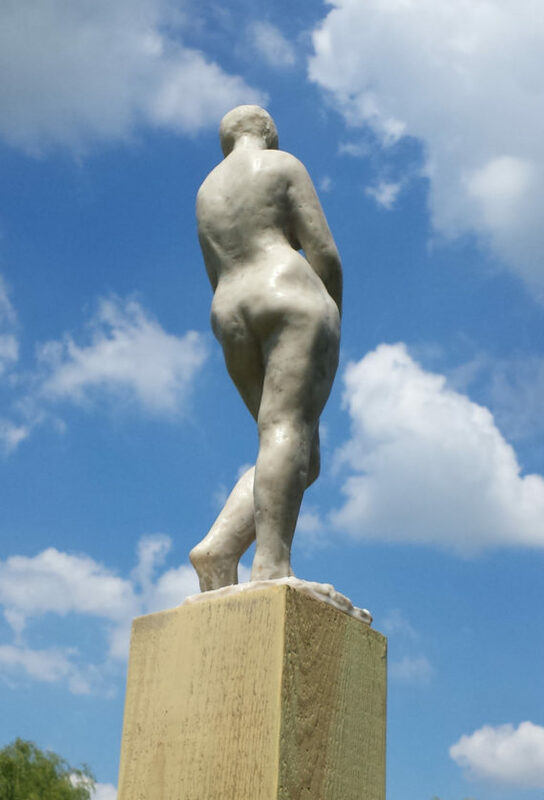 What stood out following the sculpture trail through beautifully tended gardens and lush water meadows was the sheer variety of works. Julian Wild’s ‘Doodleform’, an elongated steel pole knotted at the upper end pointed confidently toward the blue sky, just like the magnificent trees in its vicinity. Equally Jane Eyton’s voluptuous ‘Lady on a high Plinth’ in the beautiful gardens of The Old Mill looked with serene confidence down from her lofty vantage point seen from afar, an unwitting feminist statement in classical guise. In contrast the three stunning ‘Medusae’ sculptures suspended from a tree and depicting jellyfish by the same artist were as much startling as enchanting in their unexpected habitat. Some of the exhibits perhaps not intentionally possessed the magical quality of Samuel Palmer’s work such as the delicate webs made out of glass beads spun over branches by Franny Swann, their title declaring ‘I too am a Romantic’. ‘Bacchus Without Ariadne’ and other strangely ephemeral sculptures by Fiona MacDonald were a fascinating exploration of myth, beauty and decay. ‘Nesting Head’ and other sculptures by Martha Macdonald similarly displayed an uncanny quality, representing a contemporary mythology of artistic imagination. My last stop in garden No 24 proved to be well worth the effort after having walked for hours on this hot summer day. 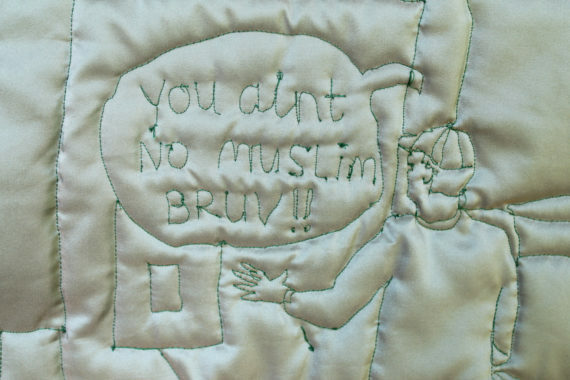 For here innocently hanging on washing lines was Tisna Westerhof’s ‘Dirty Laundry’, a series of embroidered patchwork pictures, some in stark black fabric some on white lace curtains, documenting reports of refugee and police brutality. This work was a particularly powerful statement set against the peaceful pastoral background of Shoreham. If there were too many works on display to write about here, there was not one that didn’t merit mention. 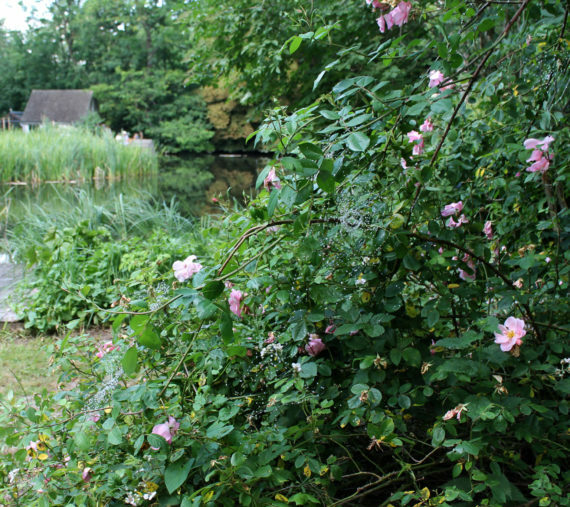 I left Shoreham impressed by the quality of the artworks I’d seen, and also by the friendly welcome of the local volunteers who opened their beautiful gardens to the public to enjoy art and nature in the spirit of Samuel Palmer. Equally amazing was the organization behind this inspired sculpture trail, and one can only hope that this year’s event will have been the first of more to follow!